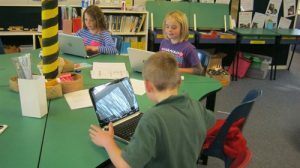 Tikokino School gives high priority to the teaching of Reading and Writing. We set high achievement expectations in our annual targets. Teachers assess regularly and use up to date information to inform their planning and teaching. We cater to individual needs, giving support and extension, through differentiated grouping and personalised programmes. We operate the Davis Dyslexia programme and the Lexia Reading programme to support students with decoding and making sense of text. Digital technologies (i-pads,tablets, notebooks, computers) are an integral part of our literacy and integrated curriculum.